“I look forward to coming each and every day. Coming in and seeing the smiles on all the children’s faces is definitely the best feeling in the world. Listening to all the crazy, creative stories they have to share certainly makes my day. I absolutely love coming to program. I have so much fun, and love everything about it. “One of the things that sticks out in my mind is how comfortable the women are knowing that they are in a safe environment and they can have conversations while getting and giving advice to one another. I will always remember the free clothing drive where the community came together supporting those in need in our community. “My name is Devvon. I am 22 years old and I have autism. I have volunteered at different programs and agencies and am now volunteering with Malvern Family Resource Centre. I like to volunteer, as I like to meet new people. I get to do new things where I learn and get better, help others and keep busy. I am happy to be there. By volunteering I also hope to one day get a job with one of the places where I had volunteered. Volunteering with the seniors department at MFRC is fun and relaxing for me. I feel good, and I think they like me too. I do not have grandparents so being with the seniors is special. They are nice and friendly. They speak with me and ask me to play games. I help set up for the activities we are going to do. Feedback from a parent on Facebook. “I know that I am no different than many other people that are really struggling right now and the chance to be included in something like this has literally left me overwhelmed, my eldest son has now for the 1st time in years his own NEW blanket and pillow, he is so happy and it is so great to see, my youngest son is autistic and when I gave him his own new teddy I was not sure how he would like it, well he LOVES it, he is chatting away with his new best friend, I just want to thank you so very much for helping us out like this, we are in such a low place right now that these items have really made a REAL impact on our lives and how we are feeling. I would have never thought that I would be someone in this much need or someone that was struggling this hard and I just wanted to make sure that they know that these items actually really have impacted our lives and even our warmth this winter and I swear that one day when things are better for me I will do something like this for someone else. “I spoke with the staff that was present and she had nothing but positive feedback. She said Laryl presented well and made the residents feel quite comfortable with your approach and sharing. Also, one of the residents approached me and said she really enjoyed the presentation. She liked that it wasn’t someone preaching to stop doing drugs but more of how to cut back and be safe. 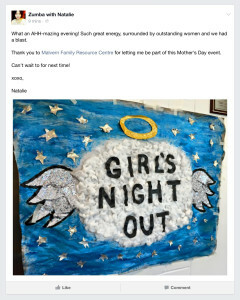 Feedback from a presenter on Facebook for our Mother’s Day event. “We want to congratulate Hamza Atta and Keelan Williams as the #MLSEFdnLeader for August. As a resident of the Rouge River/Malvern community for over ten years, 16-year-old Keelen is an active member of the Malvern Family Resource Centre. Outgoing, helpful, hardworking and athletic, Keelan starting volunteering with the YMCA to help get more kids active in the community. After being a participant for many years, he wanted to give back. “You need a coach to help you get better. When you have someone that can motivate kids to get outdoors and away from technology, that’s important,” he said. Hamza, like Keelan, is a community youth volunteering his time with the Malvern Family Resource Centre. A four-year resident of the community, Hamza is a hardworking sport and academic enthusiast with dreams of becoming a doctor one day. His love of sports led him to coaching. “It is different from being a player to being a coach; I learned how to transfer my experience with different sports to teaching it to kids,” he said. For the past few years, Toronto FC has played a friendly game with a European team who travels to Toronto. This year, Sunderland A.F.C. was that team. As part of their interest in playing Friendly games, Sunderland participated in some community work by leading a clinic for the Malvern Community Resource Centre. Both Keelan and Hamza were volunteering that day to ensure the clinic went off without a hitch. Their engagement in the clinic and the subsequent question and answer period caught the attention of our sport development staff. Because of their amazing engagement in the Sunderland Clinic, Keelan and Hamza were offered paid positions to work at our own TFC summer Camps and Clinics. “I am a mother of three kids ages 4, 8 and 10. 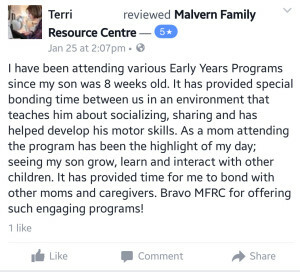 My family has been coming to Malvern Family Resource Centre for 6 years now. We have benefitted from the programs offered by the Early Years Centre and Youth Centre, such as the after school program. 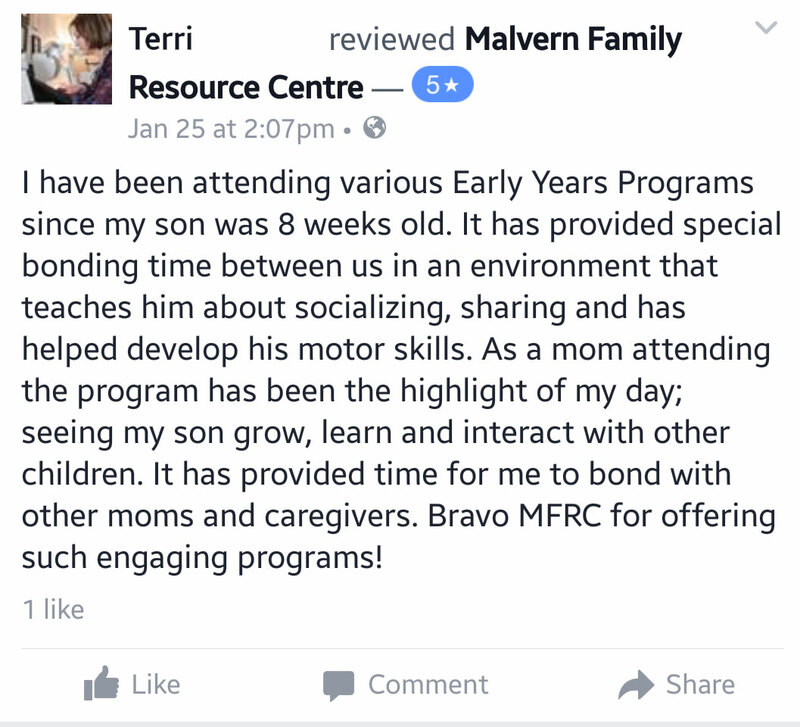 MFRC has played a tremendous part in our lives with their programs geared specifically for different age groups and stages that aids in child’s development from early childhood to youth. “Malvern Family Resource Centre plays an important role in my life. I got to know about this kind of centre from one of my friends. Then I started attending Resource Centre regularly from August 2011. I liked its diversity in programs, activities and teaching techniques.At that time my child was under 3 so I used to go for programs like “All About Me” and “Together Time”. My child learned quite a lot in a few days. She could sing almost every rhyme with actions and through these songs she learned counting and the alphabet. Even I got to know how, why and what to play with my child. Also how to tackle their mood swings.